Nearly 1,800 fruit pickers—many undocumented—spontaneously walked out of The Wonderful Company's citrus orchards earlier this year to oppose a pay cut and third-party labor contracts. The sun is setting on the east side of Bakersfield, California, as Salvador Calsadillas sits down with his cousins and their kids for a dinner of caldo de mantarraya, a hearty stingray and tomato stew, a specialty of the coastal regions of the Mexican state of Sonora. Calsadillas and his family are from Oaxaca, further south in Mexico, but like many others, they moved to Bakersfield looking for work. Bakersfield is the entryway to California’s 450-mile-long Central Valley, the site of a sprawling $50 billion a year agriculture network that produces more than one-third of the country’s vegetables and two-thirds of our nuts and fruits. Calsadillas and his family are farmworkers—essential parts of that huge commercial network, although their pay and working conditions don’t reflect how central they are to the industry. Calsadillas and the three other adults around the table worked for The Wonderful Company, one of the largest agriculture businesses in the entire state, if not the country. The privately held company grows, harvests, packages, and bottles an array of products through a number of subsidiary companies, including Wonderful Halo mandarin oranges, Sweet Scarletts grapefruits, Wonderful almonds and pistachios, Fiji Water, POM Wonderful pomegranate juice, and Landmark wines. 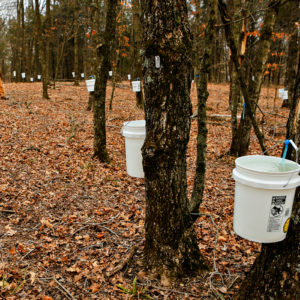 The company, which recorded a profit of $4.2 billion last year, frequently touts its philanthropic ventures, social responsibility, and investment in “ the communities where our employees live and work.” These include nutritional programs designed to keep the workers in some of their operations healthy and charter schools with a curriculum co-designed by one of the company’s owners. “[They are] truly the top 1 percent wrapped in a green veneer, in a veneer of social justice,” is how Barbara Barrigan-Parrilla of Restore the Delta described Wonderful to Mother Jones. 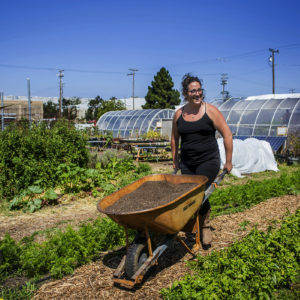 “If they truly cared about a sustainable California and farmworkers within their own community, then how things are structured and how they are done by the Wonderful Company would be much different,” she added. On January 11, 2019, the company announced, through its contractor field supervisors, that it would reduce farmworkers’ pay by 12 percent. 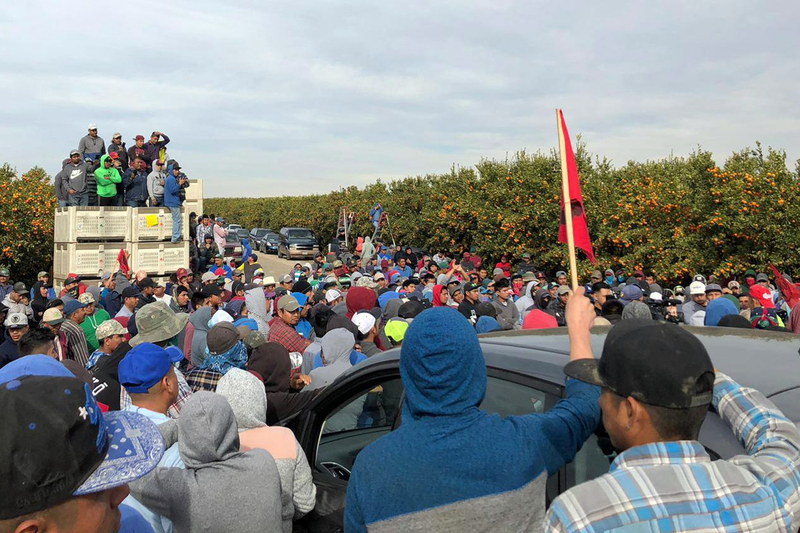 In response, about 1,800 nonunionized farmworkers, the majority of whom were undocumented, spontaneously walked out of Wonderful’s citrus fields outside of Bakersfield. 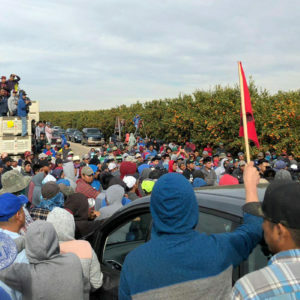 The workers, including the men and women sitting around Calsadilla’s dinner table, joined what became one of the largest non-unionized, undocumented labor strikes in recent history, and one of the largest farmworker strikes since the heyday of the United Farm Workers (UFW) in the 1960s and ‘70s. 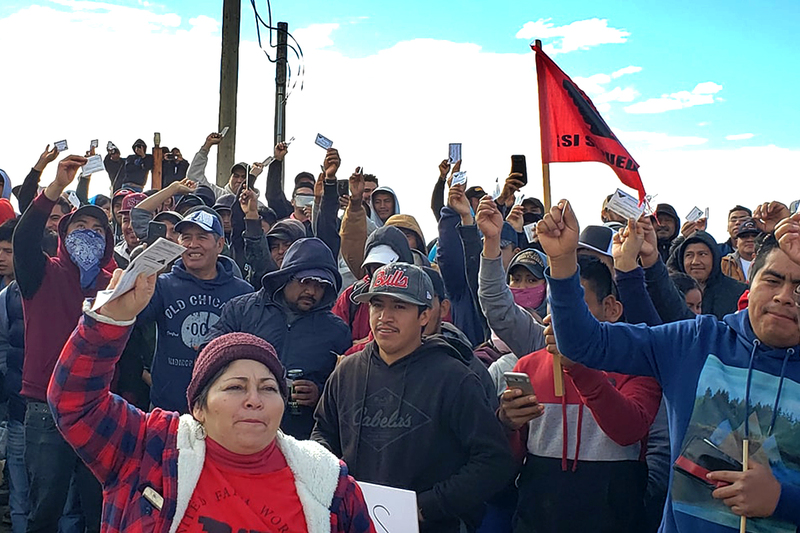 Through four days of protests at the edge of the fields, the workers—with assistance from UFW—not only won their wage rate back from one of the largest and most profitable corporations in the country. They’ve also begun to expose a predatory and mostly under-the-radar farm labor contractor system, and they’re part of a larger effort to revitalize and empower workers in the food system. Calsadillas is in his early 30’s, but his peach-fuzz mustache, snapback hat embroidered with the California state flag, and frequent bright smiles make him seem like a carefree teenager, not a man who has worked one of the most dangerous and backbreaking jobs around for years. The strike centered around the workers that pick Wonderful’s mandarin oranges. The fruit’s mascot—the product of a $100 million advertising campaign launched in 2014—is a beaming animated clementine with a glowing, golden halo which appears in grocery stores in pastel blue crates suggesting that they fall effortlessly into the hands of eager farmers. But Salvador knows first-hand that the harvest is far from that. He describes climbing a ladder to the tops of tall, flimsy trees to gather fruit, a task made more dangerous during the winter, when strong gusts of cold wind rush through the valley. The final straw came when his supervisors announced early on the morning of January 11 that the rate their pay would drop from $53 to $47 per bin of fruit, which take about four hours to fill. About 1,800 workers walked out of the fields that day, protesting and posting pictures and videos to social media sites. In one video, Salvador and other protesters, flanked by posters and flags, announce their solidarity with the United Teachers Los Angeles (UTLA) teachers union strike that was taking place that same week in Los Angeles. “They [were] given more students per classroom; it’s like getting a decrease in salary. We felt connected to them since we were going through similar struggles at the same time,” Salvador explained. 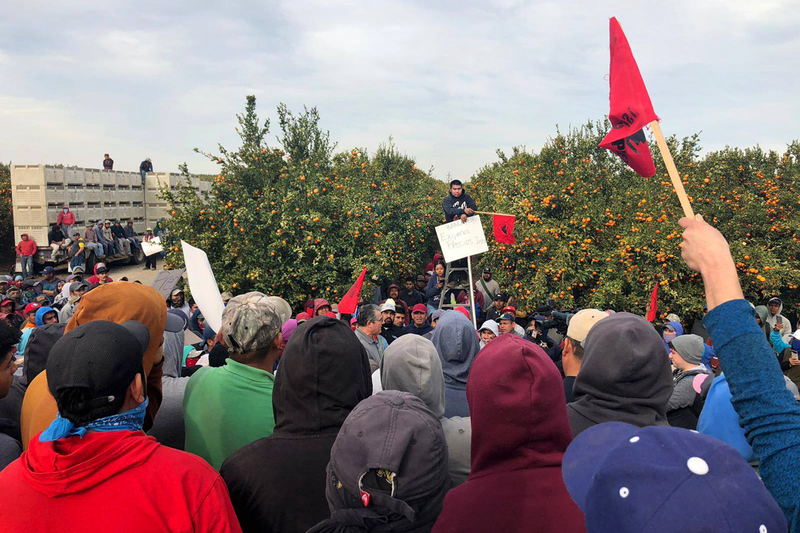 UFW flags are prominently displayed in the video, and some of the striking workers had been involved in UFW actions in response to other companies, but neither Halos nor any other Wonderful subsidiary had any ongoing unionization efforts. When the strikers walked out of the fields that day, multiple people contacted the UFW for support, in hopes of protecting themselves against foremen and supervisors who threatened to call the U.S. Immigration and Customs Enforcement agency (ICE), to deport undocumented strikers. The union ended up providing temporary protection for the workers. Salvador says he believes that the contractors and the company afforded them more respect in the process once they knew that the UFW was on their side. The union also helped with outreach and contacted local media about the strike. The farmworkers union, co-founded by César Chávez, Dolores Huerta, Larry Itliong, and Philip Vera Cruz, has won access to clean drinking water, bathrooms, health care, and wage increases for thousands of farmworkers since the 1960s. But for years in its beginning had an often uneasy relationship with undocumented immigrant laborers. José Z. Calderón, professor emeritus of sociology and Chicanx/Latinx studies at Pitzer College, is a former organizer for the union. He says that there were instances when the union attempted to reach out to undocumented farmworkers in the 1960s and 70s, but that the union originally considered undocumented farnworkers as “scabs”—laborers who were “being used by the federal government, the growers, and these middle men,” to break UFW strikes by being brought in to work in the fields while UFW members held the picket lines. But he adds that the union’s approach has evolved. The Halo processing and packaging plant outside of Delano, the town where both Wonderful and the UFW started, is one of the biggest plants in the world, processing over 19 million fruits a day. In December 2018, a month before the strike, Wonderful announced that it planned to raise the minimum wage for direct-hire workers to $15 an hour, which came just a month before California’s historic law requiring farmworkers be paid overtime began to go into effect. But Calsadillas doesn’t work directly for Wonderful, nor does anybody else he was sharing dinner with; they all work for a third-party labor contractor employed by Wonderful. Big farms can choose from a plethora of contractors to supply them with laborers and as a result, the companies don’t have to provide the workers with benefits. They pay them an average of 44 percent of what direct hires make, and generally stay one step removed from the working conditions and lives of those laborers who work on their farms—not unlike the way Lyft and Uber contract with their drivers. Sixty-five percent of the farmworkers in Bakersfield and the surrounding Kern County are contract workers, the largest concentration of contract farm laborers in the state. “That is the strategy of these large corporations: to use third-party labor contractors and to carry out injustices while they carry on making masses and masses of funds,” says Calderón. After four days of protesting and withholding their labor, the Wonderful strikers won their original bin rate back. Some workers, like Calsadillas, changed their contractors, and some left Halos completely, but most chose to stay. Now that it’s over, the workers, and the UFW, are considering staging a vote to unionize. In the meantime, Elenes has set them up with a law firm to try and win more concessions from the company, including getting Wonderful to trim the mandarin trees down, and to provide the workers with tools so they don’t have to buy and clean their own. Suzette Aguirre, MPH, provided translation assistance with this article. This article was updated to correct the name of the co-owner of The Wonderful Company, Stewart Resnick. Informative article, thank ypu for providing. Will watch for more from you. Good news for people who deserve protection. The solidarity between the Union and the undocumented immigrants is revolutionary. The rich always pit us against each other, and looking out for the interests of all workers is the only way we can take back that power. Thank you for covering this important development. It is inspiring to see people mobilizing on this scale for justice. I just wanted to note that César Chávez co-founded the union with Dolores Huerta -- I think it's important to recognize her equal contribution. Thank you again. Thank you for noting that, Sarah; the list of co-founders got shortened during edits, but I've reinstated them. Good work!! Is the strike over now, or should we still avoid buying Halos? Work union, buy union, the job you save may be your own. I am an a activist and would love to help support this wonderful action and volunteer too help these great folks and this great cause; it is so incredibly important- i live in San Diego; is there anyway i can get involved ? solidarity from NC! also wondering the same thing. anywhere we could send letters of support or number to call in to some officials? Please Support the farmworkers they cannot afford a pay cut! How can we contact the Wonderful company directly to let them know we support the fruit pickers? Right-on! More and more info about farmworkers in the news. It's about time!! God bless your efforts and fill you with renewed strength to fight this Injustice!